For 2 or 4 players, who are adults because "it is illegal for British pubs to serve alcoholic beverages to persons under 18 years of age"
Do you like beer mats? Do you like inns? Do you like taverns? Do you like pub crawls? Do you like board games? 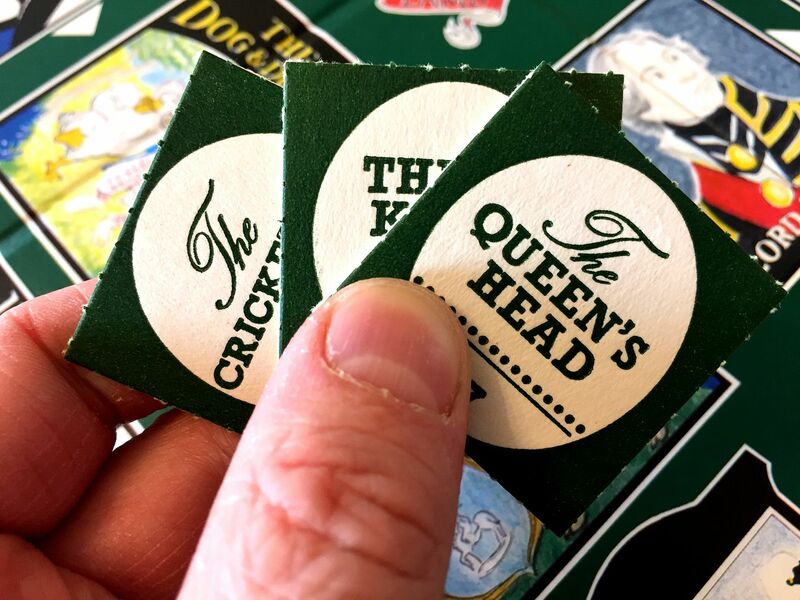 Do you like board games about going on pub crawls around inns and taverns collecting beer mats? If you do then... you have very particular tastes, and probably find it very difficult to find games that appeal to you. Furthermore, you're going to hate The Game of Inns & Taverns. I mean, sure, it's probably the first game you've ever found that's tailor-made for your particular peculiarities. But that just means it's going to hurt a little bit more when you find out it's absolute dross. Yes, ladies and gentlemen; I've been away from my keyboard for a little while, and I'm feeling feisty. That means only one thing. It's time to review something awful. 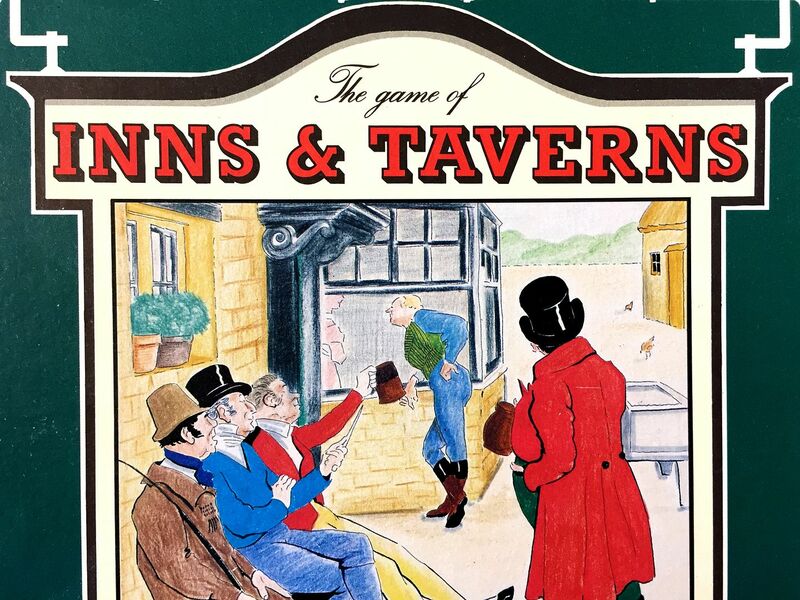 Today's victim is Inns & Taverns, which is one of those games that isn't really a game. It's an activity. Something to do with your hands in polite company that won't get you arrested. It's not even a very good activity. Certainly not compared to many of the other hand-related activities you could be doing instead. It's the kind of activity that (somewhat ironically) doesn't even get better when you're slightly inebriated. It's also one of those games that sounds quite fun when you first look at the bits and read through the rules. 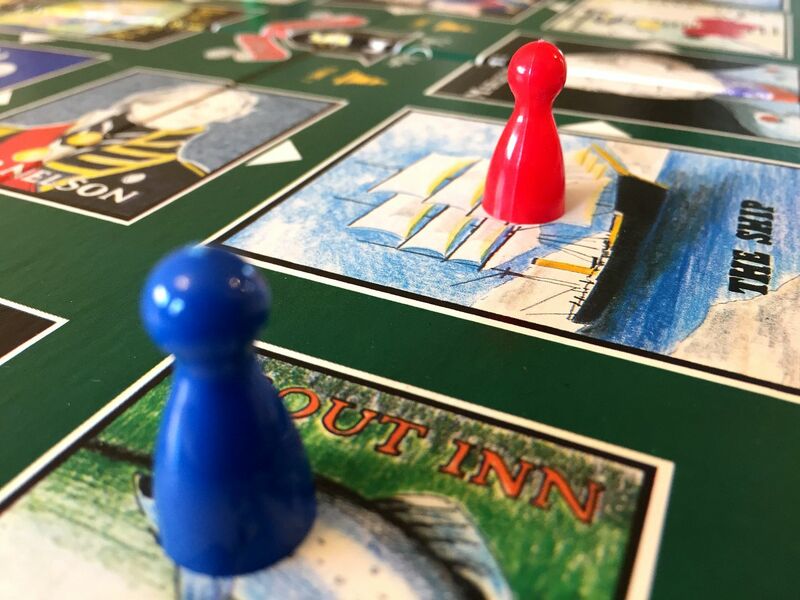 The game (which seems to be primarily for two players, with an odd-duck four-player mode tacked on for good measure), involves moving your little plastic pawn around a playing board featuring a path of famous pub signs. 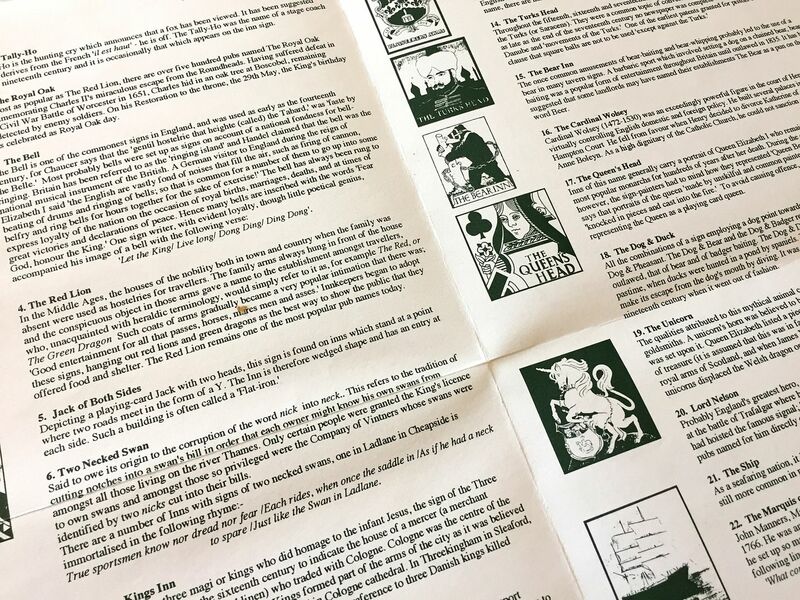 It should be noted that the artwork for the signs is actually rather quite pleasant, and the publishers have gone the extra mile by including some background information on the origin of the pub names and signs in the rules. It's a lovely little touch; and reading the history of the "Two Necked Swan" or "The Royal Oak" is infinitely more interesting than actually playing the game. So, your plastic pawns start at "The Tally Ho!" (I know this, because it says on the back of the box, not in the rules), and on each turn you have an opportunity to advance along the street of pub signs on a "pub crawl." Each sign has a cute little beer mat on it, and if you land on the sign, you get to keep the beer mat. This continues until one player reaches "Ye Olde Lion and Lamb" at the end of the path, and shouts, "Time!" at which point the player with the most beer mats wins. Alternatively, this continues until someone suggests going on a real pub crawl, or casually sweeps the game off the table to make room for something better. Straight From the Heart, the Jason Donovan board game. Something like that. Anyway, so far, so ordinary. But the heart of the game - the bit that makes it sound quite interesting - is the bluffing and deduction mechanism for movement. 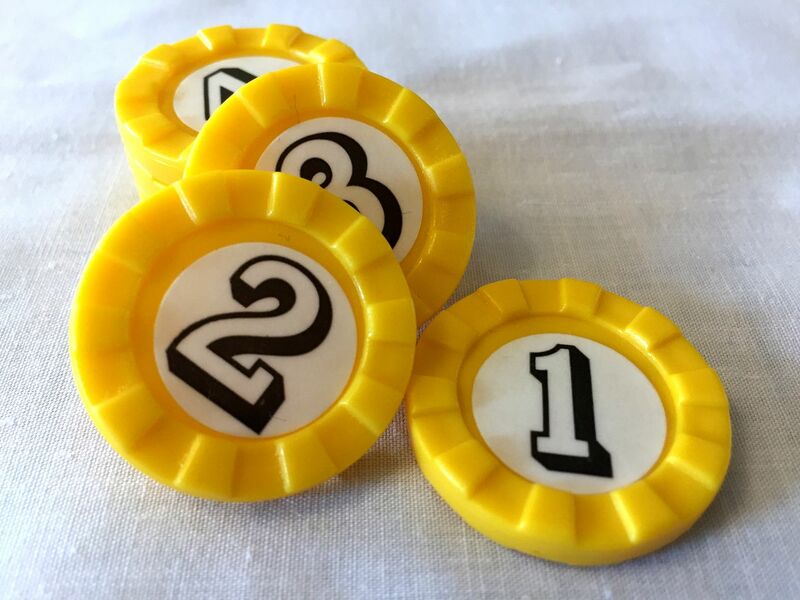 Each player has a hand of six plastic poker-style chips, numbered (rather shockingly) one through six. When it's your turn to move, you don't roll a dice; instead, you secretly select one of your chips and place it face-down in front of you. Your opponent then selects a chip. You both reveal your chips at the same time, and compare the numbers. If you both picked the same number, you can't move this turn. If you picked different numbers, you're allowed to move the difference between the two values. For example, if you played a three and your opponent played a six, you could move the difference of three spaces. And here's the really interesting part: After you've played a chip, you aren't allowed to use it again until you've used the remaining five chips (at which point your hand refreshes). So, at the start of the game, you have all six numbers to choose from; but gradually your options dwindle, and a savvy opponent is going to remember what you've played and use that knowledge to cancel out your subsequent moves. At the start of the game, every space has a beer mat on it, and you have all six numbers to choose from. So, how do you want to play? You probably don't want to play a one or a six, as your opponent could play the opposite end of the spectrum and force you forwards five spaces, so you miss all the early beer mats. Splitting the difference and playing your three chip seems like a good idea, as you have a higher chance of an average move of two or three spaces. But will your opponent guess that's your plan and play a three chip too? 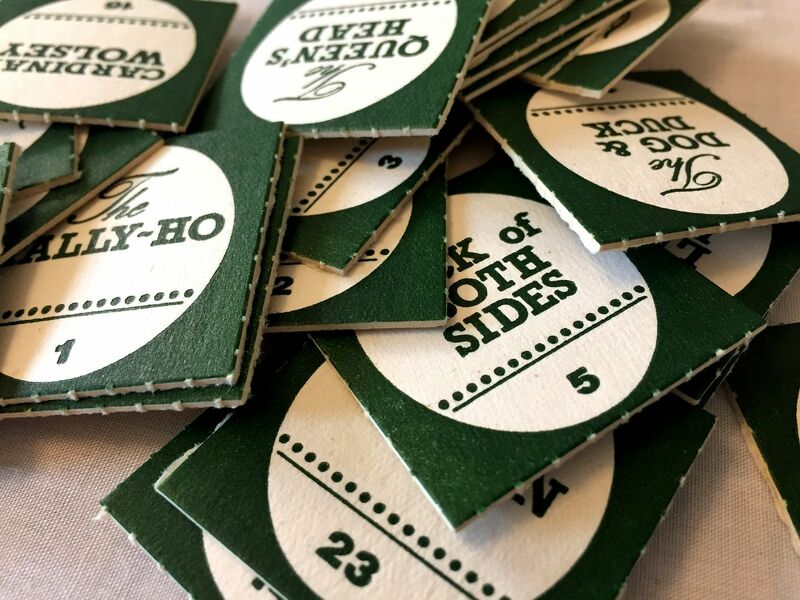 Later on, as the number of beer mats on the board reduces, and if you've remembered what your opponent played, there's more opportunity for bluffing and deduction. Will your opponent play the obvious chip to ensure he or she lands on that beer mat two spaces away? If you're certain which number your opponent is playing, do you want to match it to cancel his or her move, or would you rather keep your matching number back, so that when you play it on a subsequent turn you know there's no risk of being blocked because your opponent has already used that number? I could go on, but I think you get the point. It seemed like the potential is there for some serious mind games. Theoretically, there's something crunchy about this simple pub crawl game. Something which has nothing to do with pork scratchings. 1. You can move forwards or backwards on the path. 2. The first person to reach the end of the path gets to claim every beer mat left on the board. The first rule seems innocent enough, but it robs the game of strategic options. You can't force a player to move too fast down the path, overshooting early beer mats to deny them points, as they simply have the option to backtrack on subsequent turns. Furthermore, it makes the game slightly too forgiving. Someone scuppered your plans to move forward this turn? Never mind; maybe you can hop back a space and pick up that previous beer mat you missed. But it's the second rule that's the real kicker. The game is supposed to be a race, but the incentive to be in front and to finish as soon as possible is just too strong. 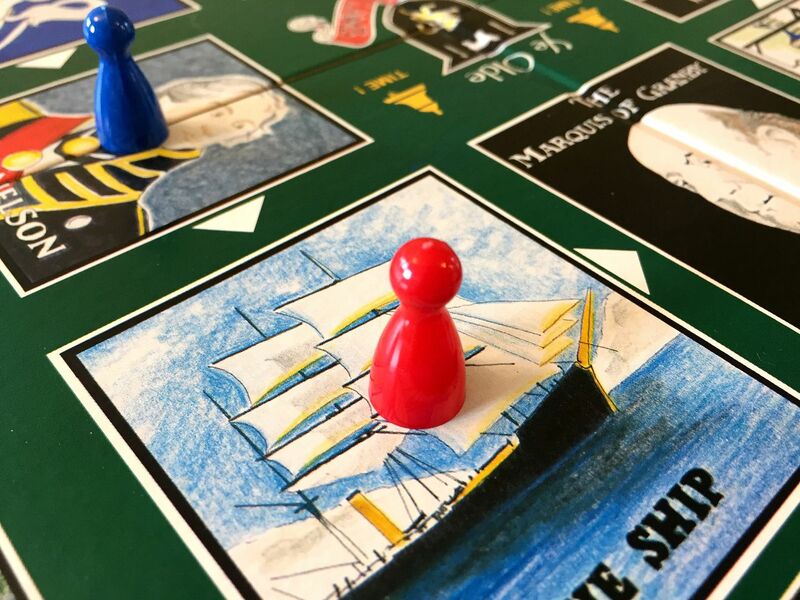 While you're at the front of the pack, every move you make lands you on a beer mat, so you don't need to think too hard about what chips to play; meanwhile, your opponents behind you have to carefully plan moves to land on the beer mats you've left for them. And once you finally get to the end of the path, you get to immediately claim any beer mats you missed getting there. They should have called this Runaway Leader: The Game. In fact, I played this game with someone who managed to get slightly ahead of the other players. For the rest of the game, he didn't even look at the chips he was playing. He drew them randomly. It made it impossible to out-bluff him, and it hardly mattered what he played because every move he did make landed him on another beer mat because nobody could get ahead of him to create some gaps in the path. Ultimately, the game seemed to devolve into trying to move as fast as possible, rather than trying to move as accurately as possible. I'm not even sure how possible it is to be accurate with your movements. After all, if you have six chips, your opponent has six chips, and you want to move exactly two spaces, which chip would you play? Whichever number you choose, it's the number your opponent counters with that determines your movement. Half the time it feels like you might as well just roll a dice. And maybe I'm being unfair. Maybe I just don't see the nuance in the design. I thought I did. Reading the rules, I thought the game sounded pretty interesting. But the reality is, it's just a bit boring, and the central mechanism - the bit the whole game hinges on - doesn't provide the meaty decision-making I thought it would. At least, not for me. Not for my gaming group. Oh, and that four player game: It just involves playing in two teams, with teammates sitting opposite each other. Play continues exactly as normal, but at the end of the game, teammates get to add their beer mats together. It's no more fun than it sounds. And so, I can't recommend Inns & Taverns. Although, I did quite enjoy putting my feet up with a beer and reading through the notes on the history of signboards and the different pub names. I guess, if I was being generous (or damning with faint praise), I would say that when it comes down to it, the game captures its theme perfectly. Pub crawls always sound like a good idea, and when someone suggests one there's always a moment of anticipation. But once you're out, you realise that trudging between pubs isn't particularly exciting, and the whole endeavour is a bit random and silly. It doesn't take long before you start wishing you'd decided to do something else instead. Like reading a good book. 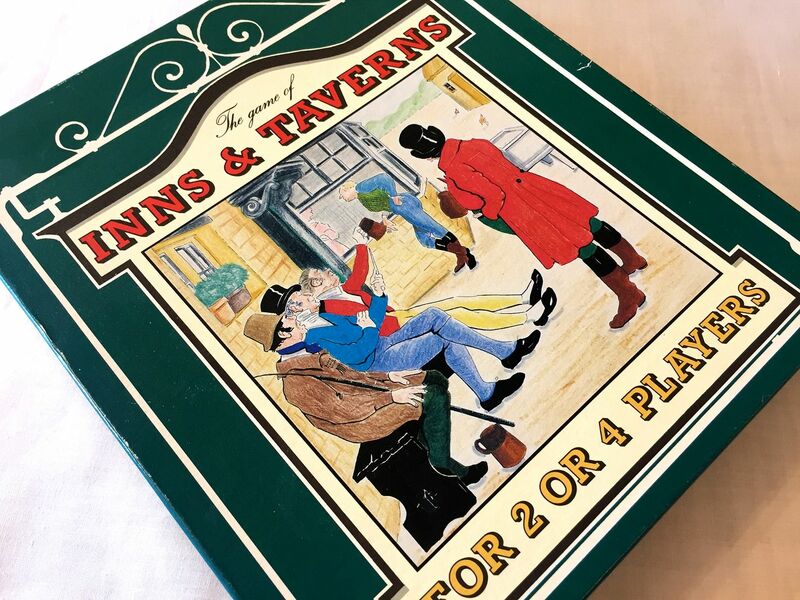 The Game of Inns & Taverns was published in 1995, and is no longer in print (to the best of my knowledge). However, you can buy loads of much better games. I suggest you check out some of those instead.